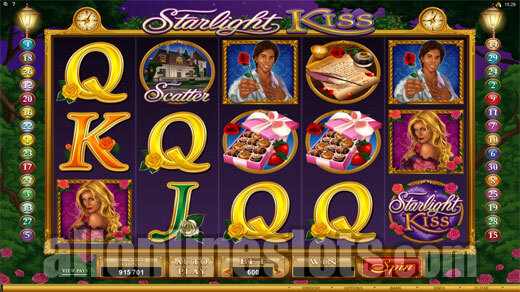 Starlight Kiss is a 30 line Microgaming video slot with a romance theme. The game has a free spins bonus where you win 12 free games with all wins doubled and a pick a box style feature where your bonuses can be multiplied by ten. 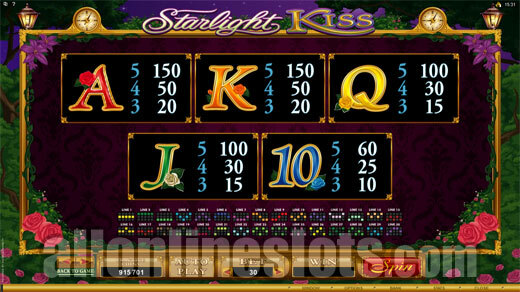 Starlight Kiss is a 30 line video slot from Microgaming that was released in time for Valentines Day 2013. The game has two bonus features, coin sizes starting at 0.01 and a max bet of 600 coins or 20 coins per line. 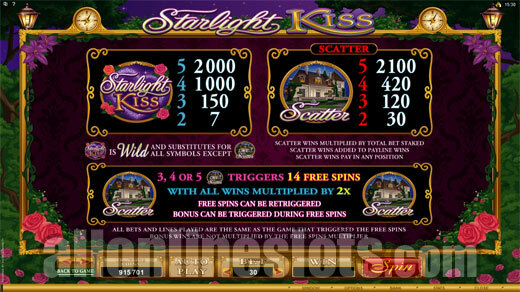 The Starlight Kiss logo is wild and substitutes for everything but the scattered Romance Bonus symbols which only appear on the middle three reels and the scatter symbols. Getting five wilds on an active pay line award 2,000 coins or 40,000 coins if betting max. Interestingly the highest pay on the base game is not for the five wilds but instead for the five scatters. Getting five scatters pays 2,100 coins or 42,000 coins if you are playing max. The Mansion scatters are also the key to the free spins with three or more awarding 14 free games with all wins doubled. After the top two pays for the wilds and the scatters. The rest of the five of a kind wins come in at between 700 and 60 coins (14,000 and 1,200 at max bet). The stand out pays are the five Men or Women which give you 14,000 coins. There is also a mixed pay for any Men and Woman symbols on a line which pays up to 4,000 coins for five mixed. The hearts are the key to getting the biggest wins out of the bonus as they award multipliers on top of the bonus pick awards. Collect two for a X2 multiplier, four for a X3 multiplier, six for a X4 multiplier, eight for a X5 multiplier and ten for a big X10 multiplier. 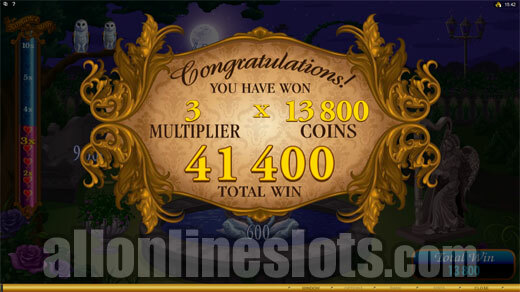 During our review the best possible outcome from the bonus we saw was a 138,000 coin win. It is quite rare to see a game where the pick a box stage offers bigger wins than the free spins but this is the case with Starlight Kiss. 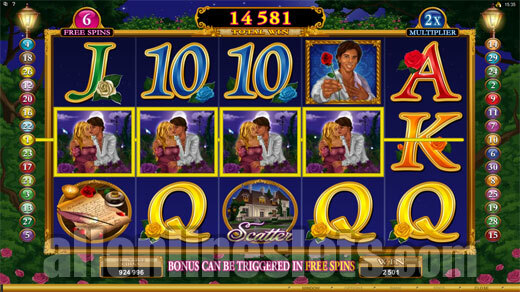 While the theme might not be to every ones tastes the game does offer quite a few good base game jackpots with the the free spins and Romance Bonus also offering some nice pays.